Homeschooling Today magazine | Sensitive to Yucky Textures, Help! Sensitive to Yucky Textures, Help! Welcome to the hands-on learning series by Stef Layton, where she answers questions she’s received about tactile learners. Do you have a hands-on learner? These posts will give you great insight, advice, and practical application tips. Enjoy! Homegrown Homeschooler asked, Do you have any ideas for kids who are sensitive to “yucky” textures? I have a daughter who won’t try most hands on activities if she doesn’t know the material is going to feel like. ​The simple answer is stop using “yucky textures”. If you are teaching a hands-on learner try to incorporate resources a child will want to use in order to help understand a concept. Unlike the time I had my oldest son cut open a rotisserie chicken and inspect the backbone. I thought it was a great hands-on learning opportunity. He did not. The poor boy still can not walk near the chickens in the deli aisle without gagging. Do not be afraid to ask your hands-on learner what resources they want to use. Let them stroll the store aisles and see what items they gravitate to naturally.My oldest son does not like Play Doh but likes modeling clay. To me there is little difference but to him it’s a world of difference. So I buy modeling clay. My youngest son doesn’t even like legos! (gasp)My next suggestion if you are adamant to incorporate the sticky textures, latex gloves. You can grab a box of gloves at most pharmacies and stores. The skin to sticky contact will be less offensive. 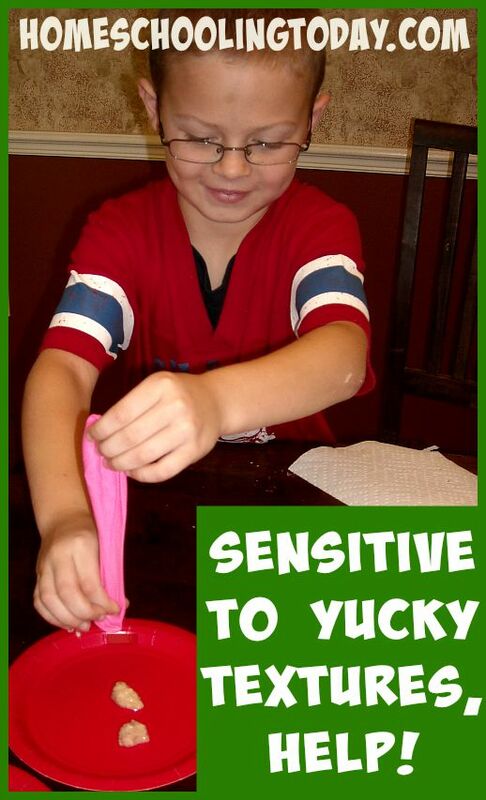 Plan a little time for those sensitive hands to explore the sticky items before the activity starts. Ask questions, “what does it feel like, what does it smell like to you?” more importantly, “why don’t you like it?”. If you have carefully introduced the sticky textures and your child is still not thrilled ~ avoid those hands-on projects. YouTube offers many great videos and activities. Watch the experiment rather than participate. I can say for sure I would much rather watch the cow eyeball dissection than do it myself. One bad hands-on activity can ruin a bunch. Do not force an activity if a child is uncomfortable. Ultimately, the concept and learning opportunity will be a failure. We want to create an environment where learning is a joy!